Gary Churchman - Stone Carver and Letter Cutter - London UK. Enjoying the experience of 38 years working with stone, clay and drawing. 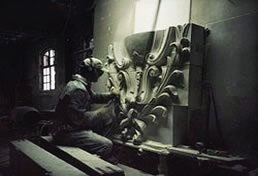 Having first carried out a 3 year indenture apprenticeship in stone carving and lettering, during this time I furthered my education completing many residential stone carving, lettering and also day release courses studying sculpture and form. I directly followed the apprenticeship with a year Art Foundation course then progressing to study for a B.A(Hons) in Fine Art, Sculpture at the University of Northumberland. Since graduating in 1983 I have been working freelance as a stone carver. Classical forms of flora and fauna particularly interest me, a lifelong passion for horticulture, architecture and design are a continuing influence and inspire my interpretations. Plant forms play a major roll in many historic forms of decoration, many features applied to buildings have their roots firmly in the evolution of these forms, of particular importance is the Acanthus and the Angelica both extensively used since classical times in many glorious interpretations. Liberating three dimensional forms - carving shallow or deep relief, figurative, foliage or floral, sometimes patterns or elaborate designs, these variations along with creativity are the essence of my stone carving work. Civic, secular or ecclesiastic either working within the confines of the studio or on-site. • St. Pancras Gardens, City of London. Please contact me for a comprehensive C.V. if required.